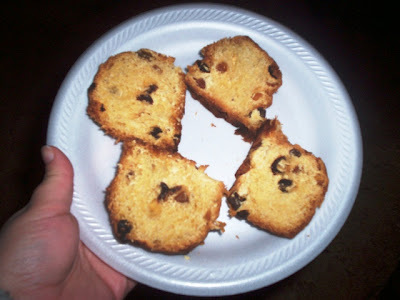 January 13, 2008: My family has found a whole new appreciation for Panettone - as French toast! Mom made dinner with it tonight, giving it a whole new moistness and delicious flavor. We definitely recommend doing this, especially if you've received one as a gift and aren't that crazy about the taste. Now is not the time to waste food - turn this Panettone frown upside down and make some French toast! You won't be sorry. 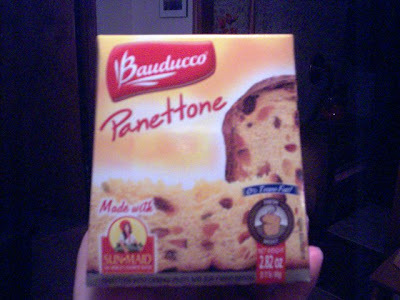 Remember back in December 2008 when Mom wrote a review of Bauducco's Panettone? We said that it sorta tasted like crap? Well, almost three weeks after the review was published, I received a letter from the USA Manager of Bauducco Foods (you'll see his comment posted below). 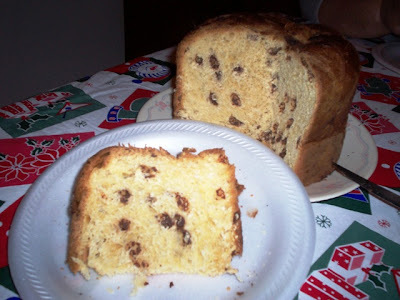 He encouraged us to try Panettone again, and even offered to send us one free of charge! How could we pass up that offer? 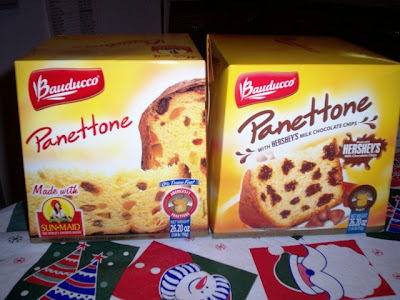 On Friday, we received not one, but TWO large boxes of Panettone - one regular-flavored, and one flavored with Hershey's chocolate chips. Since we had already tried the fruit version, we went for the chocolate chip one first. This time, Dad was in on the eating, giving us a third opinion. When we first opened the box, both Mom and I were a bit disturbed that the paper wrap wasn't coming off as easily as we expected. Mom actually had to cut a thin layer off the entire bottom of the cake just to remove the paper, which seemed to be almost baked on. Once we'd gotten that out of the way, we each had a slice. 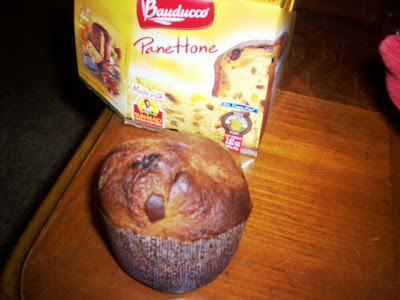 Before taking a bite, we got a bit nervous because this Panettone had the same distinct aroma and texture as the smaller version that we tried before - and didn't care for. Fortunately for us, this cake had a much better texture and was more moist than the previous one - just as the manager had told us it would be. 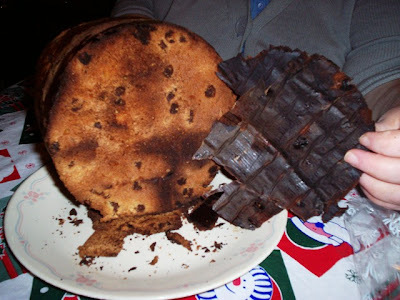 The taste of this particular cake was also much better than the smaller one, perhaps because of the chocolate chips. However, it just isn't a taste that Mom and I - or even Dad - are fond of. Perhaps it is an acquired taste, but it certainly must be a popular item as we have been seeing Panettones in just about every supermarket. It was extremely thoughtful of the people at Bauducco Foods to send us more of their product to sample. Both Mom and I definitely recommend buying a Panettone for yourself and giving us your honest opinion. We're still in the works to make the fruit Panettone that we received into some delicious French toast as other people have suggested. We'll let you know how it turns out!